Many were also were angry over Alan Jones involvement in the incident. 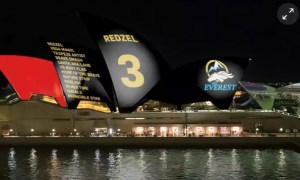 Hundreds of protestors gathered at Sydney Opera House last night in an attempt to thwart efforts to project a controversial advert onto the heritage-listed building. The movement is part of the backlash following NSW premier Gladys Berejiklian agreeing to let Everest project the ad. The decision, which was against Opera House CEO Louise Herron’s wishes, reached fever pitch when radio presenter Alan Jones called for her to be sacked. Crowds attended the protest and many used their mobile phones as torches in an attempt to block the Everest display when it went up at 7.40pm. The Australasian Lighting Industry Association (ALIA) used festival lights to block the advertisement, adding industrial strength lighting to the effort.